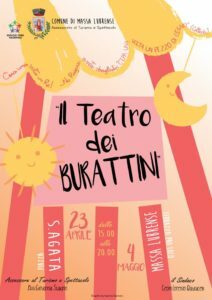 The highlight event of the summer of Massa Lubrense. 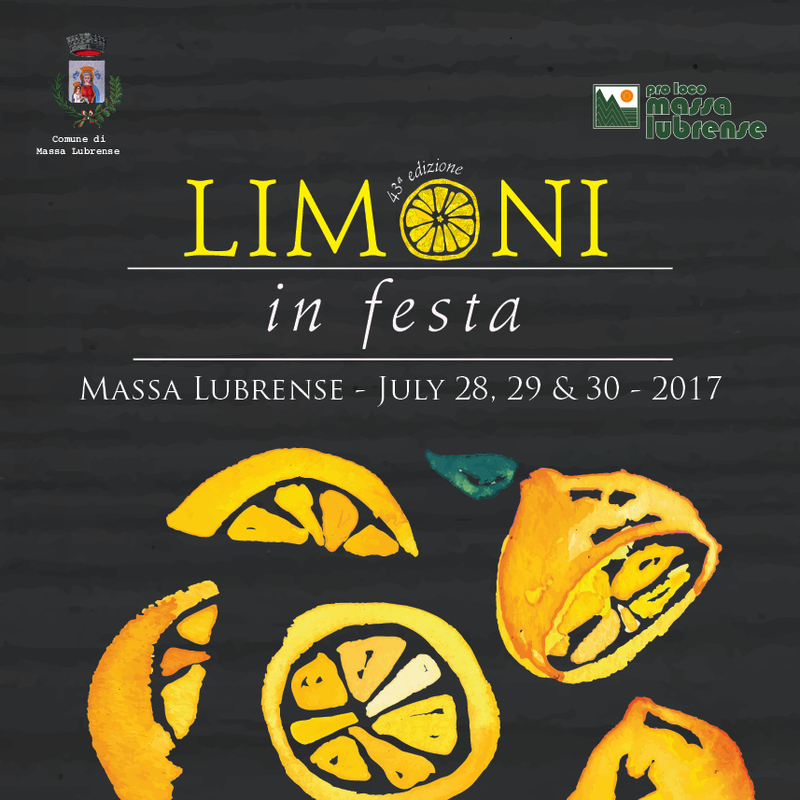 An excellent opportunity to taste many delicacies of the cuisine of Massa Lubrense based on the typical citrus that gives the name to the festival: our oval lemon called “femminiello”. 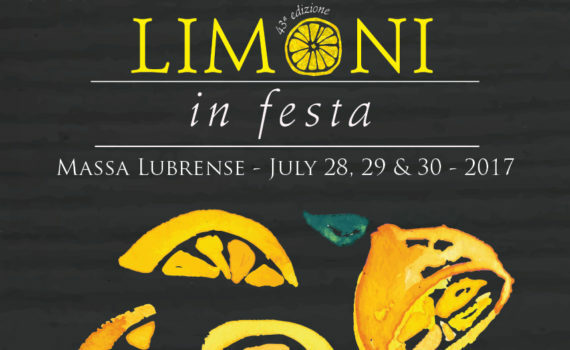 A series of events taking place in the city center, following the flavors of dishes with lemon scent, the sounds of popular music, the rediscovery of the oldest buildings, the streets, the typical corners. 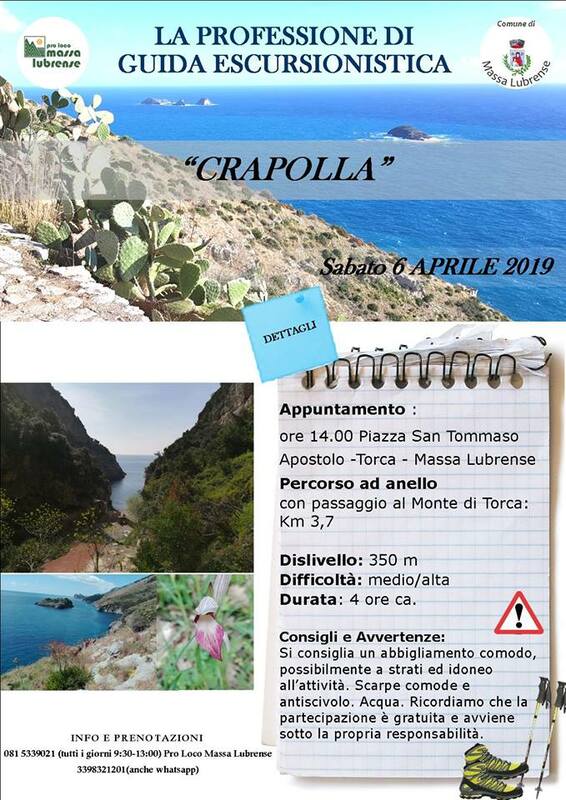 On 2018 the Campania Express, the tourist train between Naples and Sorrento, will be active from March 11 to October 14th. The Campania Express train is air-conditioned, has video surveillance and 144 seats, plus four for the disabled. 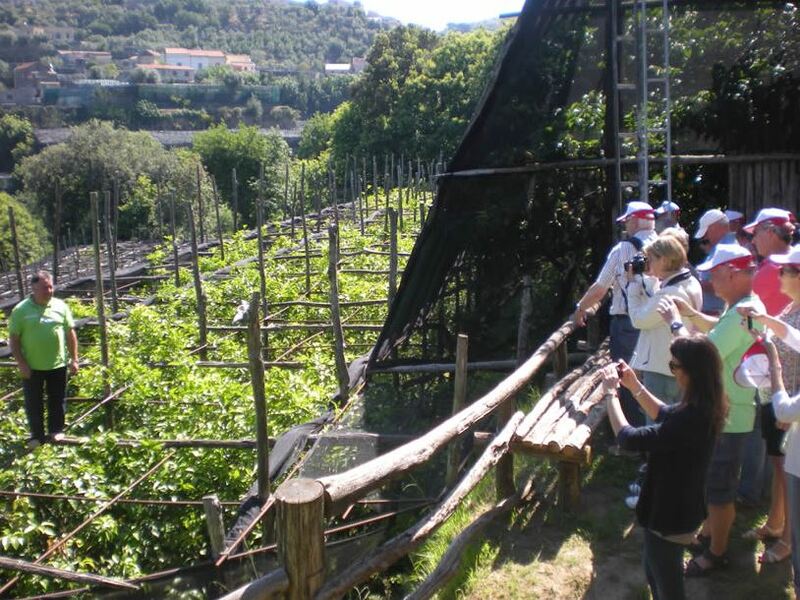 It’s a fast and comfortable connection that takes visitors directly into the heart of some of the major tourist attractions of the Region: Sorrento, Vico Equense, Castellammare di Stabia (Faito cableway), Pompeii, Oplonti, Ercolano and Naples. The round trip ticket allows you to make the return journey on a different date of the outward journey. On the date of the outward and/or return journey, it allows you to get off at the intermediate stops and then continue your journey. In this case, the reservation does not guarantee the availability of seating in the intermediate sections. The main event of the summer in Massa Lubrense, an excellent opportunity to taste many delicacies of the local cuisine based on the typical citrus fruit that gives its name to the festival: the oval lemon said “femminiello”. 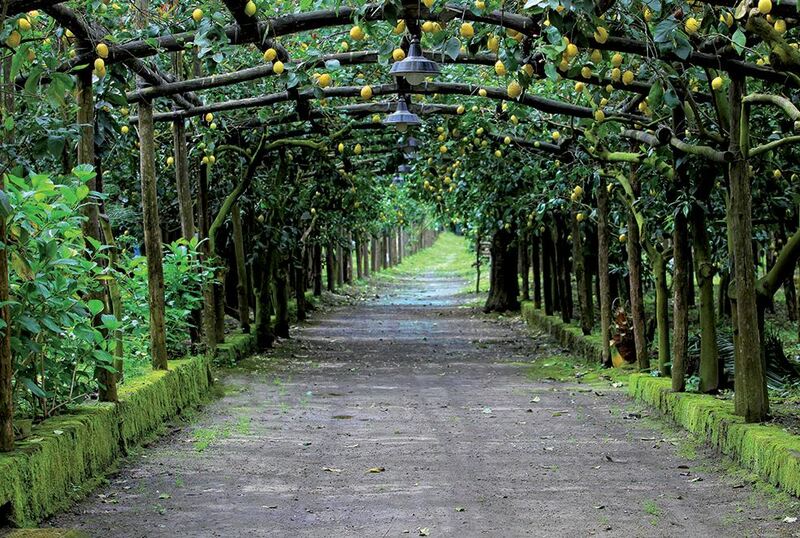 A series of activities that take place in the city center, in a lemon-scented atmosphere, enjoying the sound of folk music, rediscovering local crafts and art inspired by our land. All walks include lunch: first course, dessert, water and wine. The cost per person is € 10.00. Following the fire that affected much of the Monte S. Costanzo, in particular the area upstream of the municipal road Ieranto, by order no. 164 of 26/08/2016, the transit of said road has been disqualified. 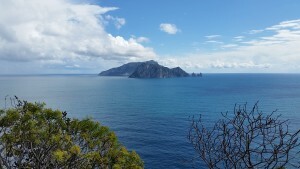 Therefore, you can not reach the Bay of Ieranto, and activities of the FAI calendar are suspended. The conservatory of the most holy Rosary rises in the heart of the Monticchio’s Village, one of the eighteen typical villages of Massa Lubrense. 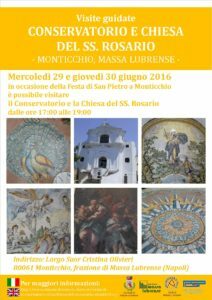 Monticchio is located in a very wide valley on the west side of S.Maria della Neve . The square of the village, where the most important church consecrated to S.Pietro rises, is located at 315 meters above sea level. The Village, however, it extends up on the hill, even more then 350 meters. 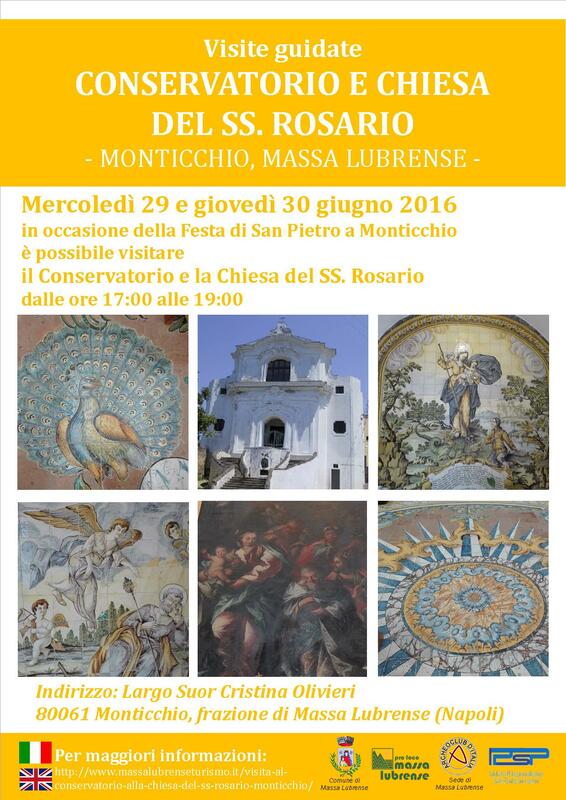 We have knowledge of Monticchio from 1221, when the old church of S. Pietro was founded. In the 1489 it was named “ Monditio”, and it counted no more then 179 inhabitants. The village of Monticchio takes its name from its position, up on a mound. There are fountains, gardens and hunting place of Focetole and Turdi. The foundation of the Conservatory was strongly wanted By Cristina Olivieri, a young and devout Neapolitan women, who since 1707 used to spend her holydays in the village of Monticchio, guested by the Tizzano’s family. During this time she worked so much to pick up the money nedded for the construction of the cloister. Once she did it, sister Cristina bought two small areas near the local church, and after she got the approval of the bishop De Rossi in 1723, she invited the priest of Monticchio to bless the first stone. This event raised a general discontent between the citizens of Massa Lubrense, already harassed by the privileges of the Religious Corporations. In fact between the 16th and the 17th century, there was a great expansion f the religious cult and the sacred buildings add up to as many as 100. The religious multiplied. 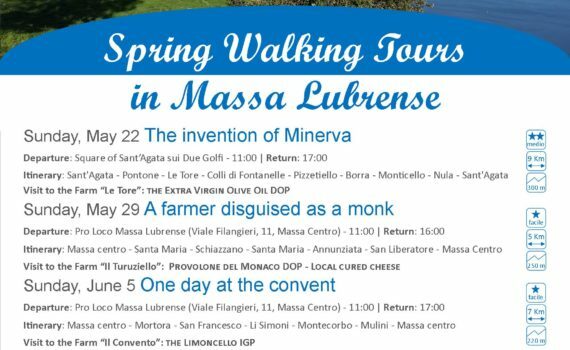 At the beginning of the 18th century, thanks to the several acts of mercy, which have happened over the past two decades, the churches, the chapels, the monasteries and the abbeys, they owned almost the entire territory of Massa Lubrense. The city ended with a wealthy class made up of religious and a poor one, which included the rest of the citizens. 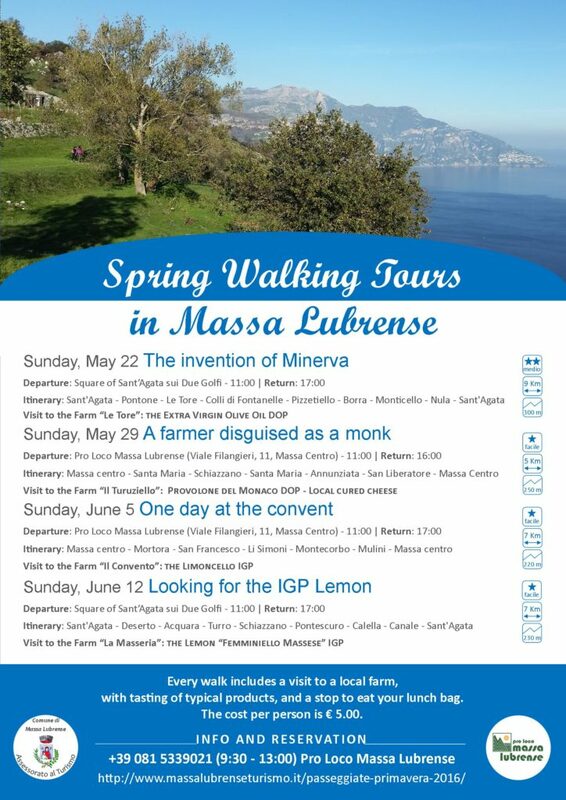 The people of Massa Lubrense were forced to resort to the holy Roman Congregation and to the Viceroy of Naples, in order to protest against the construction of the new cloister. Sister Cristina Olivieri, to bypass such demands, she declared that those factories were built as a private use. The protest and the objections of the citizens and the defense of the founder they continued for several years, in the meantime the construction of the building, it kept. In the 1746 the Conservatory was finished and inhabited by nuns. Attached to the cloister there is a church name after S. Maria del Rosario and both the buildings they belong to the order of S. Domenico. The Co. founder of the complex was Ignazio Chiaiese, a great artist of the Neapolitan earthenware in the 18th century, who belong to one of the most important dynasties operating in this type of art in the city of Naples between the end of the 17th century and the 18th century. Also the tiles of the Congregation in the Cathedral of Sorrento, and the decorated wall still visible in the yard of Palazzo Correale, are attributable to this factory. Ignazio Chiaiese was the son of Leonardo, author of the floor “ The Expulsion from the Garden”, in Ancapri. He arrived in Monticchio on behalf of his aunt, who a few weeks before, she had brought her daughter to the cloister. She regretted and she asked him to help her. She asked him to get to the cloister , free her daughter and bring her home. The legend says that Ignazio Chiaiese, once he was at the presence of Sister Cristina Olivieri, was fascinated by the women with the blind eyes, in which he saw the heavenly light of the conversion. Sister Cristina told him to be the man of the providence, sent by the Lord to help her in the construction of the cloister, and so he did. He also became one of its biggest donors. In fact he picked up several donations between the local wealthy families. Mastr’Ignazio, like he was called, he embellished the inside areas of the cloister and of the church using the art of the “tile”. For the first time the Virgin is represented armed, holding a spear. The Madonna in fact she is never a punisher. She is always represented as a “Mother full of Grace”. On either side of the main panel there are two more paints on tiles. The one on the left side represent a sleeper St. Joseph and the angel Gabriel who appears in his dream. Next to St. Joseph there is a flower stick, sign of the divine choice. The panel on the right side instead, it represents St. Francis likewise sleeper. The Saint sleep while a storm is taking place and a galleon is floundering. The vessel is like the one used by the Saracen pirates, which in 1558 fiercely invaded Massa Lubrense and Sorrento. The “sinking” is an allegory which means the storm of the soul. Everyone in his life get through a storm and to get over it, we have to abandon everything is force and rely on God. The force is symbolized by the sword painted on the bottom right of the composition. The church has a 17th century facade accessed by a staircase with two semicircular ramps. The inside is baroque, with an elegant architecture and decoration. The layout is a Greek Cross with very shorts arms and is underneath by a lowered cup with a torch. The construction of the church had already started in 1746, as shown Mons. Pisani who in that year, he visited the cloister which was just finished. The church instead, was finished in 1762, a date which is legible on the floor and on the pipe organ. The floor full completely covered by tiles, is gorgeous, and it was also made by Ignazio Chiaiese. The paint is dominated by a big star which symbolizes the Holy Spirit. The overlying dome perfectly match with the symbolic representation painted on the floor. On the longest rays of the star we can admire garlands of flowers. On the tiles on the sides of the High Altar, are painted four peacocks, each one in a different position, below which we found the ossuaries. All the flooring is characterized by flowers paints which most likely were chosen to remind the outside garden of the cloister. In the middle of the High Altar, we found a framework of the” Blessed Virgin of the Rosary”, and on the sides we can admire the “Dinner in Emaus” and the “Adoration of the Magi”. The technique used for the creation of the paints is the one which is characterized by the play of lights and shadows. This kind of technique was typical of the Neapolitan School in that period. In the framework of the “Last Supper”, the Apostles are represented all at the same side. There is no emphasis of the one who sinned. This kind of representation was used for the very first time by Leonardo Da Vinci to realize his paint of the “Last Supper”, exposed in the Sistine Chapel. “The Adoration of the Magi” is from the Baroque. with tasting of typical products, and a stop to eat your lunch bag. The cost per person is € 5.00. L’azienda agricola LE TORE nasce nel 1985 e si estende per circa 14 ettari tra Sorrento e Massa Lubrense. 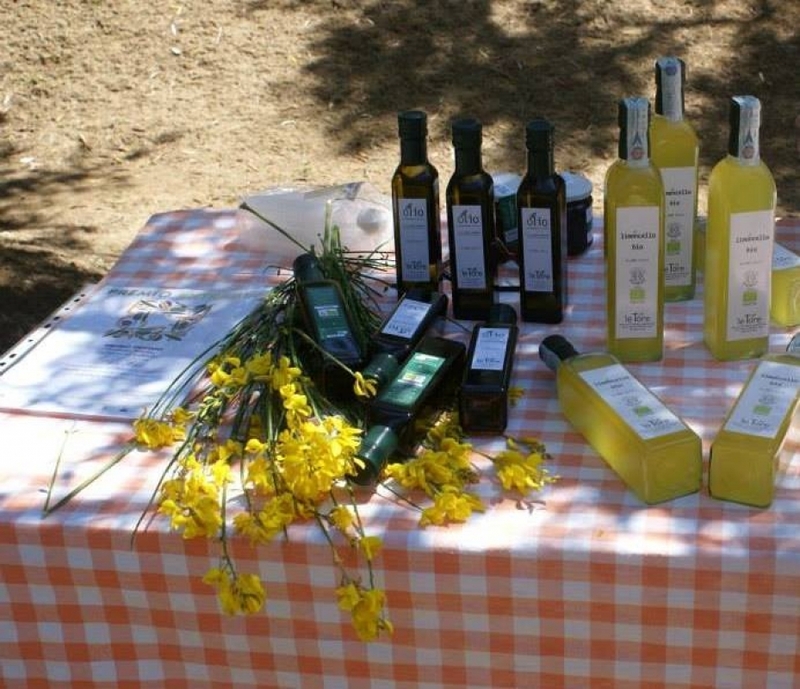 Produciamo olio DOP Penisola Sorrentina, limone IGP ovale di Sorrento,e altri prodotti tipici, come la noce di Sorrento IGP e la mela annurca e tra gli ortaggi pomodoro cuore di bue e melanzana cima di viola. Nel febbraio 2004 l’Olio extra vergine d’oliva DOP Penisola Sorrentina le Tore ha vinto il primo premio, come fruttato leggero, al concorso nazionale Sirena D’Oro di Sorrento dedicato agli oli DOP italiani. 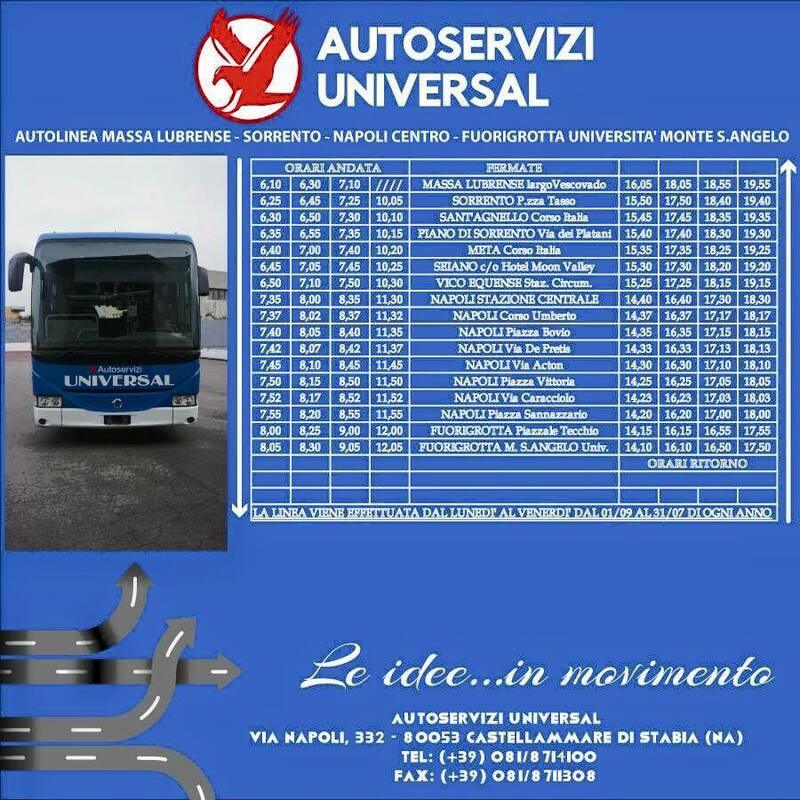 Nel 2006 è stato finalista al concorso nazionale Ercole Olivario. L’ azienda, a conduzione familiare, si avvale della preziosa collaborazione di tutta la famiglia ed è impegnata nella produzione di formaggi: mozzarelle, caciotte, caciocavalli e soprattutto provolone del monaco DOP, realizzati ancora secondo le originarie ricette tramandate da padre in figlio. Tutto ebbe inizio nel 1935 quando il contadino Antonino Pollio rilevò il terreno che i frati coltivavano per la produzione di vino, olio, rosòlio e che avevano poi abbandonato. 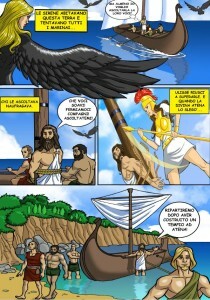 The Comic Massa Lubrense… what’s the story?! 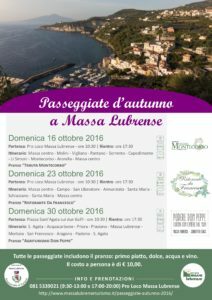 Massa Lubrense… what’s the story?! 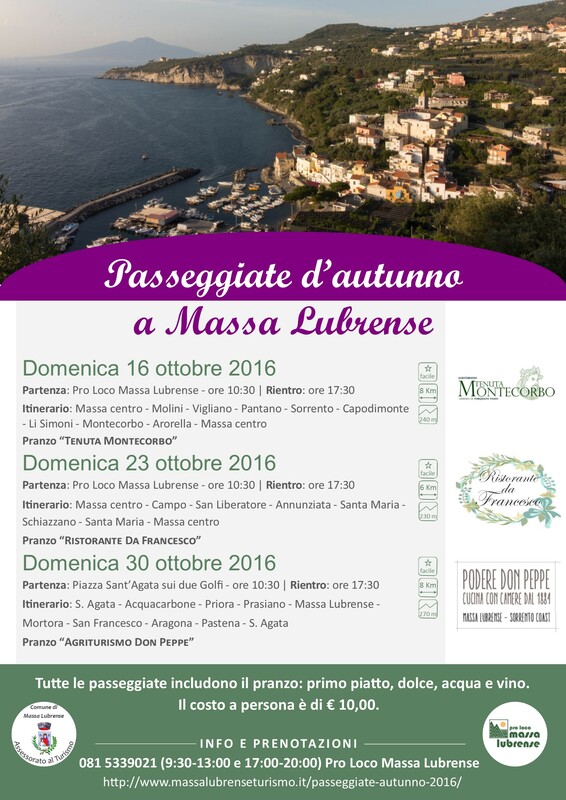 Hot off the press the first issue of Massa Lubrense… what’s the story? !, a series of five volumes that leads his readers on a fascinating journey through the myths and history of our land, particularly rich in a past to discover and visit. 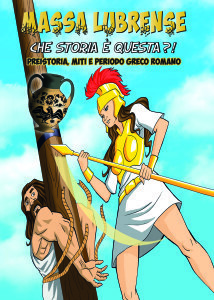 The volume Prehistory, myths and Greek-Roman period focuses on the arc of time that goes from prehistory – with the earliest human settlements in the peninsula – to the eruption of Vesuvius in 79 AD. C. – infamous for the destruction of the city of Pompeii. Protagonists of the tale and cartoon characters are those – such as the Massa’s mule, winged sirens, Ulysses – that gradually have become part of the imaginary of Massa Lubrense. 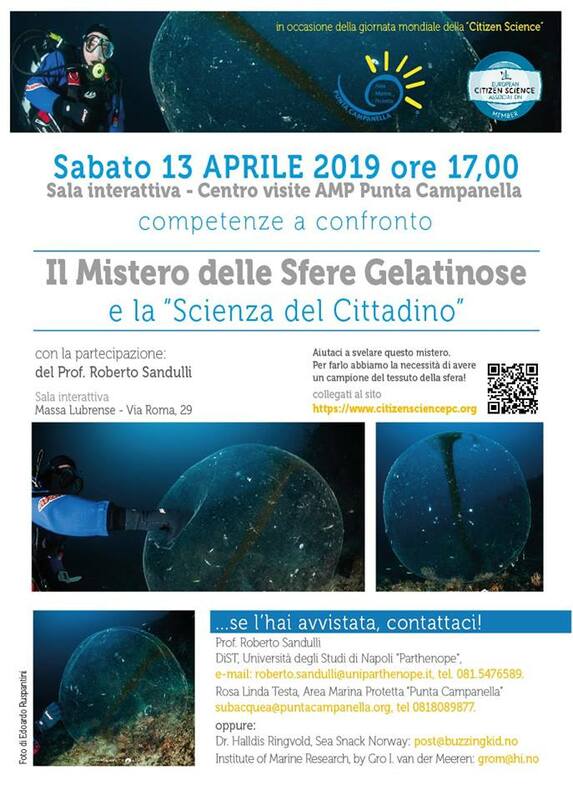 The story revolves around the events that have marked the evolution of the Sorrentine Peninsula, and highlights the archaeological finds that the time has preserved until today. Special attention is also paid to places visited along our territory, shown in the map of Sorrento at the end of the work. 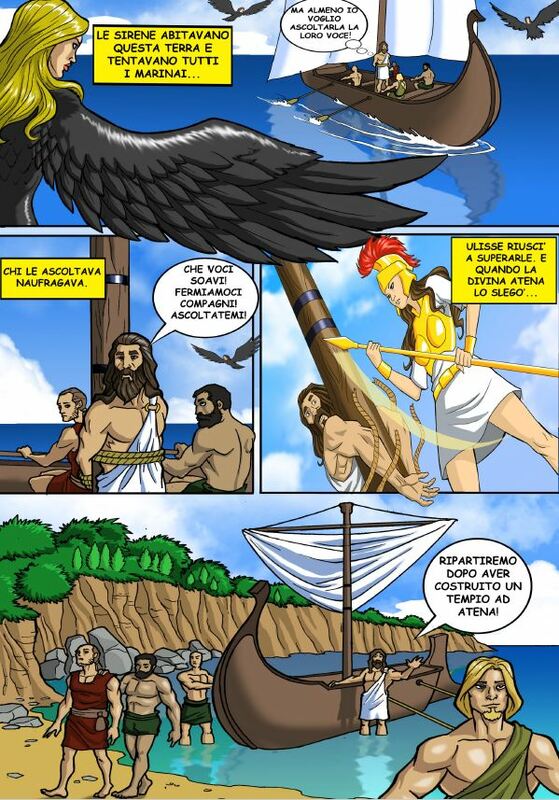 The comic Massa Lubrense… what’s the story?! is available at Pro Loco Massa Lubrense. To support the project, we require a small contribution from € 3.00. 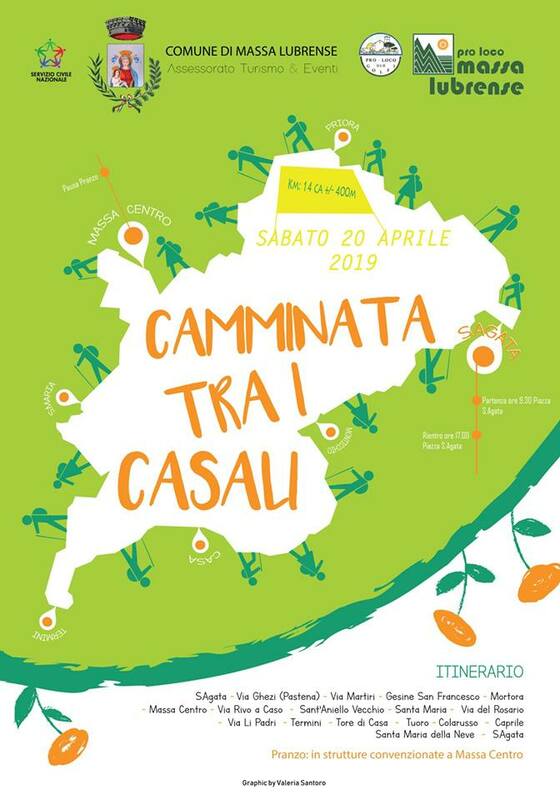 The project was designed by Pro Loco Massa Lubrense and built – in collaboration with the Cultural Association La Fenice and Archeoclub of Massa Lubrense, and with the assistance of the City of Massa Lubrense – on texts by Dominic Palumbo and drawings and graphics by Bemarking. 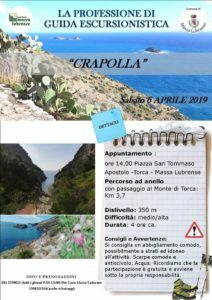 Punta Campanella closed for another month: the interdiction to pedestrian and vehicular traffic is extended until April 30th, 2016, to allow the completion of the work. 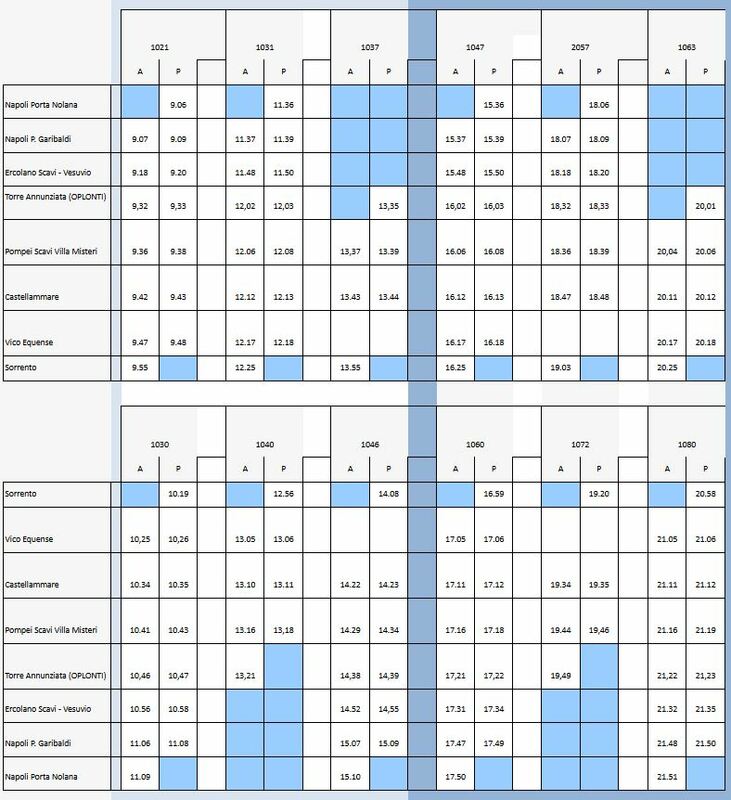 For updated timetable, please click here.